Delaware’s criminal justice, economic and educational systems need some fundamental changes, and we’re the people willing to drive that change. 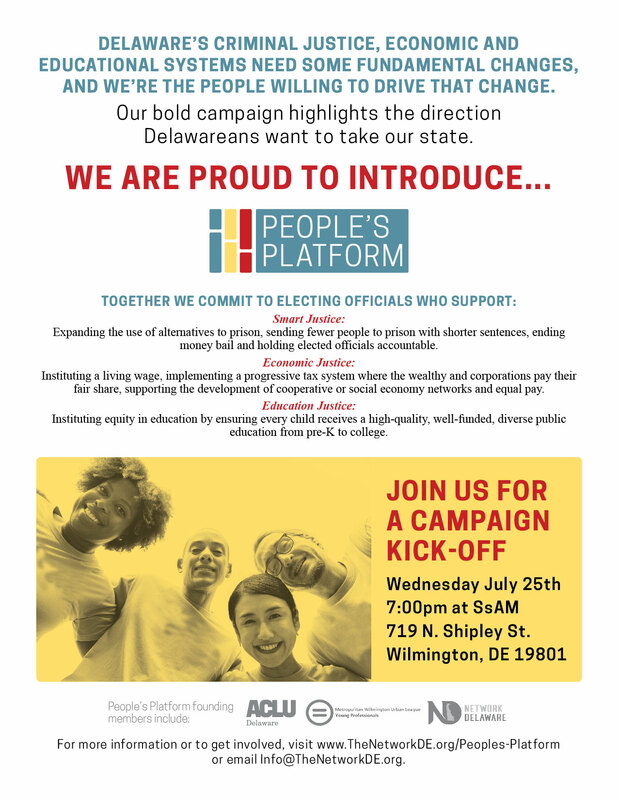 It’s time for all of us to join together with a bold “People’s Platform” that highlights the direction we Delawareans want to take our state. Smart Justice: Expanding the use of alternatives to prison, sending fewer people to prison with shorter sentences, ending money bail and holding elected officials accountable. Economic Justice: Instituting a living wage, implementing a progressive tax system where the wealthy and corporations pay their fair share, supporting the development of cooperative or social economy networks and equal pay. Education Justice: Instituting equity in education by ensuring every child receives a high-quality, well-funded, diverse public education from pre-K to college. Join us at our kick-off event on Wednesday, July 25th, 2018! Click here to download and share the flier below.